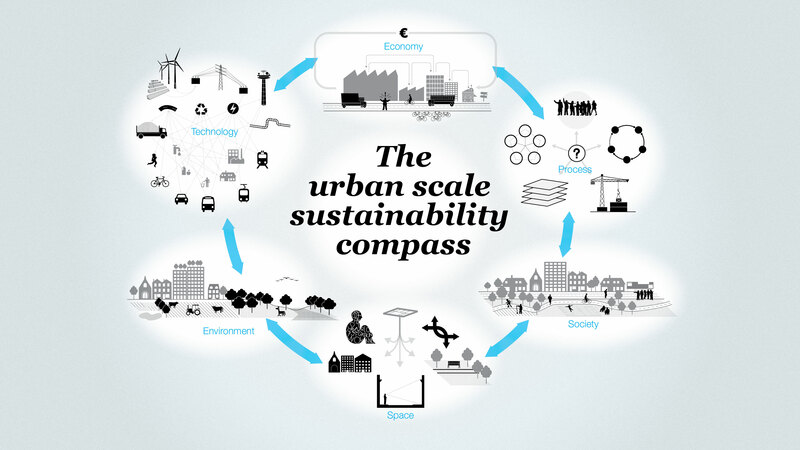 A holistic theory, tool and methodology for giving urban scale projects a sustainable orientation. The Compass helps analyse sites, create project objectives and evaluate impacts. Developed by the Bureau for Urbanism (BE). Sustainability and urban areas seem at odds and incompatible. Do we have any choice to accept this proposition? Cities are the centres of finance and innovation, of cheap manufactured products and mindless consumption, of unprecedented wealth and increasing inequality. They have stopped functioning within the limits of the environment. The huge scale increase of megacities and urban regions over the last century has turned their impacts global. While urban areas are swelling, global environmental conditions are reaching new extremes of degradation. These are problems we cannot escape – whether it be environmental, social or economic. By ‘urban scale’ we refer to all urban areas and the direct impact they have on their hinterland. Certainly there have been countless efforts to link sustainability and urban areas. However we find that none of these efforts are particularly effective. They focus on fixed solutions rather than processes of innovation. They focus on delivering a ‘tech-fix’ to deal with existing problems rather than deal directly with the source of the problem. They are focused on very specific issues without looking at the bigger picture. On this site we present sustainability as the richest and most complex problem of our age. Here we do not describe a solution but a process. We do not present a magic formula but a map of leverage points for change. It is not about trophies and points but about consciously selecting those issues that will achieve greatest quality with lowest impact. We offer an approach based on collaborative planning, dialogue, learning and adaptation. This is a blueprint for projects within BUUR (Belgium) and can be easily adapted beyond. Why did we make this site? As practitioners of urbanism we are fundamentally generalists and connect with people from a vast range of professional and cultural backgrounds everyday. Firstly we all have a different perspective on sustainability so we drafted a manifesto. We then struggle to reach a common language for sustainability so we defined a theory. We also found that some use sustainability as an excuse to justify decisions rather than a method to understand problems so we have defined a process. We explain the process through case studies to explain how we use the Compass. We’d love to stop talking about sustainability and find better ways for our urban areas to become more sustainable. © All contents of this site is copyright to BUUR cvba. No reproduction without formal consent.